If there’s one thing the house of Dior knows how to do it’s a decent masculine fragrance. In fact, one could quite easily argue that they are a dab hand at creating some of the best manly scents around, with three of the male fragrances within their stable (Eau Sauvage, Dior Homme and Fahrenheit) being nothing short of classics, each one presenting a slightly different take on style, elegance and the effortless masculinity that Dior is famous for. The latest release from Dior ‘Eau Sauvage Parfum’, a modern, more intense version of the fresh, effervescent Eau Sauvage (released in 1966), is most certainly classic and elegant. It opens with the original’s signature wave of bright, fresh lemon and bergamot but it instantly feels much warmer and richer. This warmth and richness can be attributed to the addition of myrrh, vetiver and amber. The vetiver adds a sweet earthiness tinted with a slightly anisic, liquorice-like facet that smells impeccable sitting next to the plush coumarin-like sweetness of the base notes. Dior Eau Sauvage Parfum reminds me of Mad Men’s Don Draper (the oh-so-dashing and oh-so-smooth loveable rogue). It is desperately handsome, impeccably well groomed and slightly tinged by the smell of leather and smoke. Dior describes it as having “black tie charm” and that’s pretty much spot on but in reality it is so much more than that, in fact it’s incredibly versatile and would smell completely at home on the casual, chino and polo shirt clad boy-next-door just as much as it would on a suited and booted gent in the boardroom. Housed in the signature diagonally ribbed glass bottle of the original, Eau Sauvage Parfum smartens things up a bit with a dashing black belt and cap, both of which are perfectly complimented by the forest-green juice contained inside. 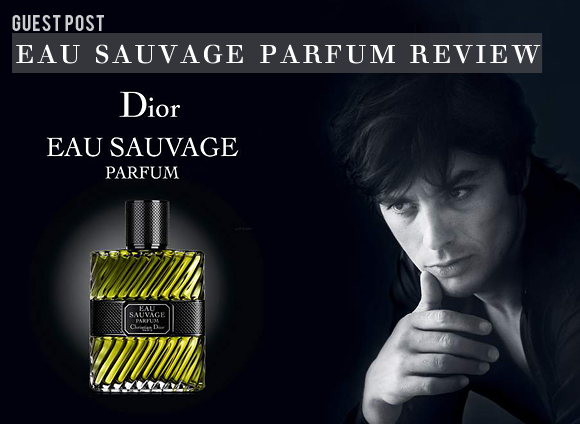 Eau Sauvage Parfum is the type of fragrance every man should have in his wardrobe. It’s an uncomplicated and versatile fail-safe fragrance that has the ability to separate the men from the boys. Plus, who wouldn’t want to smell like Don Draper? As classical and timeless as ever. Evokes lots of memories and is my favourite. This entry was posted on Monday, January 21st, 2013 at 9:21 am and is filed under Fragrance, Men, New products, Tried & Tested. You can follow any responses to this entry through the RSS 2.0 feed. You can skip to the end and leave a response. Pinging is currently not allowed. I totally agree with Thomas on this one. Now that the original “Eau Sauvage” has been re-formulated (frankly, it’s been killed) the new “Parfum” re-creates the buzz of that original 1966 release. I sampled it in Paris last Summer, and immediately bought a couple of bottles.